Chicken fingers, also known as chicken tenders, chicken goujons, chicken strips or chicken fillets, are chicken meat prepared from the pectoralis minor muscles of the animal. These strips of white meat are located on either side of the breastbone, under the breast meat. 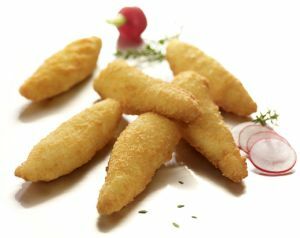 Chicken fingers are prepared by dipping chicken meat in a breading mixture and then deep frying them, in a manner similar to the preparation of Schnitzel. In the northeastern United States, chicken fingers are often made with an egg batter and have a smooth texture. This particular variety of chicken fingers, in this part of America, are often served in Chinese restaurants as an appetizer or as a main dish. Elsewhere, the breading mixture for chicken fingers can lack eggs and the texture of the dish itself can often be rather coarse. This version is often served alongside various dipping sauces. The dipping sauces can include: ketchup, blue cheese dressing, ranch dressing, barbecue sauce, honey mustard, Buffalo wing sauce, butter and garlic, plum sauce, curry mayonnaise, or sweet and sour sauce. Chicken fingers of this kind are often served in a basket with French fries, served on a garden salad, or in a sandwich, such as a wrap or on a bun.